Our cured meats are amongst our best sellers due to their originality and special artisan flavours. 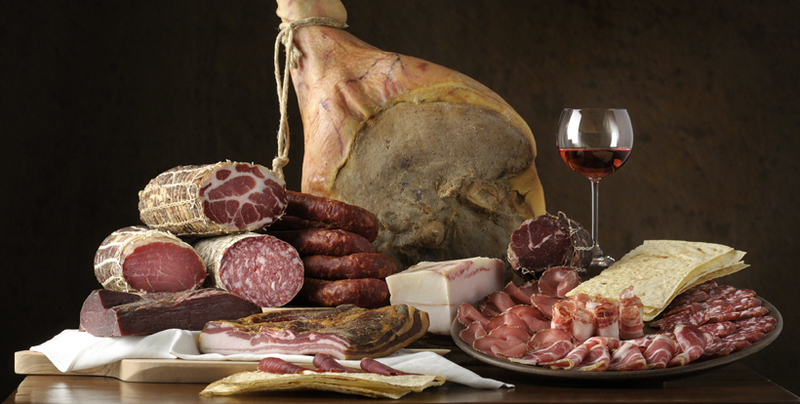 We have wild boar prosciutto, pork and wild boar brawn, pork neck, beef bresaola, organic unsmoked pancetta, organic truffle salami, salsiccia piccante and much more. Cured meats can be enjoyed as starters, as ingredients in your meals, or in your favourite sandwiches with our special Sardinian bread. Lamb prosciutto has an intense and fragrant aroma complimented with the full bodied taste of traditional, Sardinian herbs. Our unsmoked organic free range pancetta is an essential versatile ingredient in Sardinian cuisine.It has a mild spicy flavour and can be used in a variety of recipes. Lovers of hog roast simply must try our porchetta...With it's sweet and delicate flavor, try it toasted on our bruschetta...hmmm divine! A tasty I.G.P mortadella with delicious pieces of pistachio...Perfect with music paper bread and balsamic vinegar. A lovely lightly cured Sardinian salami made from carefully selected pork.Lightly cured with a delicate taste of our traditional seasonings. Taste bud heaven! Our organic free range salami with pieces of black truffle is simply divine...the perfect choice for celebration eating.